We propose a design for efficient end-fire coupling of surface plasmon polaritons in a metal-insulator-metal (MIM) waveguide with an optical fiber as part of a simple photoplastic connector. The design was analyzed and optimized using the three-dimensional finite-difference time-domain method. The calculated excitation efficiency coefficient of the waveguide is 83.7% (−0.77 dB) at a wavelength of 405 nm. This design enables simple connection of an optical fiber to a MIM waveguide and highly efficient local excitation of the waveguide. Moreover, the length of the metallic elements of the waveguide, and thus the dissipative losses, can be reduced. The proposed design may be useful in plasmonic-type waveguide applications such as near-field investigation of live cells and other objects with super-resolution. S. Kawata, Y. Inouye, and P. Verma, “Plasmonics for near-field nano-imaging and superlensing,” Nat. Photonics 3, 388–394 (2009). J. Leuthold, C. Hoessbacher, S. Muehlbrandt, A. Melikyan, M. Kohl, C. Koos, W. Freude, V. Dolores-Calzadilla, M. Smit, I. Suarez, J. Martínez-Pastor, E. P. Fitrakis, and I. Tomkos, “Plasmonic communications: light on a wire,” Opt. Photon. News 24(5), 28–35 (2013). A. V. Zayats and I. Smolyaninov, “Near-field photonics: surface plasmon polaritons and localized surface plasmons,” J. Opt. A 5, S16–S50 (2003). C. S. Kim, I. Vurgaftman, R. A. Flynn, M. Kim, J. R. Lindle, W. W. Bewley, K. Bussmann, J. R. Meyer, and J. P. Long, “An integrated surface-plasmon source,” Opt. Express 18, 10609–10615 (2010). E. Kinzel and X. Xu, “High efficiency excitation of plasmonic waveguides with vertically integrated resonant bowtie apertures,” Opt. Express 18, 10609–10615 (2010). K. Li, F. Xiao, F. Lu, K. Alameh, and A. Xu, “Unidirectional coupling of surface plasmons with ultra-broadband and wide-angle efficiency: potential applications in sensing,” New J. Phys. 15, 113040 (2013). P. A. Thomas, G. H. Auton, D. Kundys, A. N. Grigorenko, and V. G. Kravets, “Strong coupling of diffraction coupled plasmons and optical waveguide modes in gold stripe-dielectric nanostructures at telecom wavelengths,” Sci. Rep. 7, 45196 (2017). H. Kano, S. Mizuguchi, and S. Kawata, “Excitation of surface-plasmon polaritons by a focused laser beam,” J. Opt. Soc. Am. B 15, 1381–1386 (1998). J. Renger, R. Quidant, N. van Hulst, S. Palomba, and L. Novotny, “Free-space excitation of propagating surface plasmon polaritons by nonlinear four-wave mixing,” Phys. Rev. Lett. 103, 266802 (2009). H. Choo, M.-K. Kim, M. Staffaroni, T. J. Seok, J. Bokor, S. Cabrini, P. J. Schuck, M. C. Wu, and E. Yablonovitch, “Nanofocusing in a metal-insulator-metal gap plasmon waveguide with a three-dimensional linear taper,” Nat. 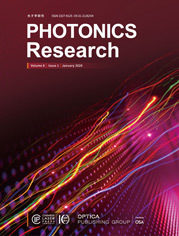 Photonics 6, 838–844 (2012). D. M. Czajkowsky, J. Sun, and Z. Shao, “Illuminated up close: near-field optical microscopy of cell surfaces,” Nanomed-Nanotechnol. 11, 119–125 (2014). H. A. Huckabay, K. P. Armendariz, W. H. Newhart, S. M. Wildgen, and R. C. Dunn, “Near-field scanning optical microscopy for high-resolution membrane studies,” Methods Mol. Biol. 950, 373–394 (2013). C. P. Gonschior, K.-F. Klein, D. Heyse, S. Baumann, T. Sun, and K. T. V. Grattan, “High power 405 nm diode laser fiber-coupled single-mode system with high long-term stability,” Proc. SPIE 8605, 86050O (2013). C. P. Gonschior, K.-F. Klein, M. Menzel, T. Sun, and K. T. V. Grattan, “Investigation of single-mode fiber degradation by 405-nm continuous-wave laser light,” Opt. Eng. 53, 122512 (2014). W. Shi, Q. Fang, X. Zhu, R. A. Norwood, and N. Peyghambarian, “Fiber lasers and their applications,” Appl. Opt. 53, 6554–6568 (2014). J. Xu, L. Huang, M. Jiang, J. Ye, P. Ma, J. Leng, J. Wu, H. Zhang, and P. Zhou, “Near-diffraction-limited linearly polarized narrow-linewidth random fiber laser with record kilowatt output,” Photon. Res. 5, 350–354 (2017). A. Taflove, Computational Electrodynamics: The Finite-Difference Time-Domain Method, 3rd ed. (Artech House, 2005). G. Patterson, M. Davidson, S. Manley, and J. Lippincott-Schwartz, “Superresolution imaging using single-molecule localization,” Annu. Rev. Chem. 61, 345–367 (2010). A. Carpio, T. G. Dimiduk, M. L. Rapún, and V. Selgas, “Noninvasive imaging of three-dimensional micro and nanostructures by topological methods,” SIAM J. Imaging Sci. 9, 1324–1354 (2016). G. Genolet, J. Brugger, M. Despont, U. Drechsler, P. Vettiger, N. F. de Rooij, and D. Anselmetti, “Soft, entirely photoplastic probes for scanning force microscopy,” Rev. Sci. Instrum. 70, 2398–2401 (1999). J.-R. Qian and W.-P. Huang, “LP modes and ideal modes on optical fibers,” J. Lightwave Technol. 4, 626–630 (1986). J. Zhu, W. Xu, Z. Xu, D. Fu, S. Song, and D. Wei, “Surface plasmon polariton mode in the metal-insulator-metal waveguide,” Optik 134, 187–193 (2017). A. S. Lapchuk, D. Shin, H.-S. Jeong, C. S. Kyong, and D.-I. Shin, “Mode propagation in optical nanowaveguides with dielectric cores and surrounding metal layers,” Appl. Opt. 44, 7522–7531 (2005). P. Ginzburg, D. Arbel, and M. Orenstein, “Gap plasmon polariton structure for very efficient microscale-to-nanoscale interfacing,” Opt. Lett. 31, 3288–3290 (2006). O. P. Parida and N. Bhat, “Characterization of optical properties of SU-8 and fabrication of optical components,” in Proceedings of the International Conference on Optics and Photonics, Chandigarh, India, 30October–1 November, 2009. K. Y. Kim, ed., Plasmonics–Principles and Applications, 1st ed. (InTech, 2012). S. H. Talisa, “Application of Davidenko’s method to the solution of dispersion relations in lossy waveguiding system,” IEEE Trans. Microwave Theory Tech. 33, 967–971 (1985). K. Kurokawa, “Power waves and the scattering matrix,” IEEE Trans. Microwave Theory Tech. 13, 194–202 (1965). Y. M. Morozov and A. S. Lapchuk, “Signal of microstrip scanning near-field optical microscope in far- and near-field zones,” Appl. Opt. 55, 3468–3477 (2016). L. Yu, L. Liu, Z. Zhou, and X. Wang, “High efficiency binary blazed grating coupler for perfectly-vertical and near-vertical coupling in chip level optical interconnections,” Opt. Commun. 355, 161–166 (2015). R. Gordon, “Light in a subwavelength slit in a metal: propagation and reflection,” Phys. Rev. B 73, 153405 (2006). D. M. Pozar, Microwave Engineering, 4th ed. (Wiley, 2012). A. S. Lapchuk, S. A. Shylo, and I. P. Nevirkovets, “Local plasmon resonance at metal wedge,” J. Opt. Soc. Am. A 25, 1535–1540 (2008). M. R. Disfani, M. S. Abrishamian, and P. Berini, “Electromagnetic fields near plasmonic wedges,” Opt. Lett. 37, 1667–1669 (2012). H. Lorenz, M. Despont, N. Fahrni, J. Brugger, P. Vettiger, and P. Renaud, “High-aspect-ratio, ultrathick, negative-tone near-UV photoresist and its applications for MEMS,” Sens. Actuators A 64, 33–39 (1998). G. A. Valaskovic, M. Holton, and G. H. Morrison, “Parameter control, characterization, and optimization in the fabrication of optical fiber near-field probes,” Appl. Opt. 34, 1215–1228 (1995). J. Luo, Y. Fan, H. Zhou, W. Gu, and W. Xu, “Fabrication of different fine fiber tips for near field scanning optical microscopy by a simple chemical etching technique,” Chin. Opt. Lett. 5, 232–234 (2007). G. I. Stegeman, R. F. Wallis, and A. A. Maradudin, “Excitation of surface polaritons by end-fire coupling,” Opt. Lett. 8, 386–388 (1983). Fig. 1. Spatial geometry of the photoplastic connector: (a) view from the PH; (b) view from the excitation area. Fig. 2. Schematic representation of the connector design: (a) view from the excitation area, (b) view from the PH, and (c) longitudinal view. d1 is a diameter of the optical fiber, and thus the inner diameter of the tumbler; d2 is the external diameter of the tumbler, and thus the diameter of the Al screen; a and u are the width and height of the PH, respectively; L1 is the length of the optical fiber; L2 is the length of the tumbler; L3 is the thickness of the Al screen; L4 is the distance between the optical fiber and Al screen, that is, the thickness of the tumbler bottom; L5 is the length of the MIM waveguide; b is the thickness of the MIM waveguide dielectric layer; t is the thickness of the MIM waveguide’s metallic coatings. Fig. 3. Contour plot and profiles of the absolute value of the electric field of the fundamental propagation LP01 (HE11) mode of a circular dielectric waveguide; white dashed circle corresponds to outer edge of the optical fiber core; red dashed lines correspond to the PH dimension along the x axis; a.u., arbitrary units. Fig. 4. Electric field amplitude (Ex) profile of the fundamental symmetric plasmon quasi-TM00 mode; b=200 nm, t=50 nm; red dashed lines correspond to the PH dimension along the x axis; black dashed line corresponds to the |E| profile of the fundamental propagation LP01 (HE11) mode of a circular dielectric waveguide along the x axis from Fig. 3. Fig. 5. Dependence of ceff_1 and power reflection coefficient |R1|2 on the Al screen thickness L3; d1=1000 nm, d2=1200 nm, L1=500 nm, L2=400 nm, L4=100 nm, a=500 nm, u=200 nm. Fig. 6. Dependence of ceff_1 and |R1|2 on the tumbler bottom thickness L4; d1=1000 nm, d2=1200 nm, L1=500 nm, L2=400 nm, L3=50 nm, a=500 nm, u=200 nm. Fig. 7. Cross-sectional view of the electric field and energy flux in the structure: (a) x component of the electric field; (b) absolute value of the electric field; (c) z component of the Poynting vector. d1=1000 nm, d2=1200 nm, L1=500 nm, L2=400 nm, L3=50 nm, L4=100 nm, a=500 nm, u=200 nm; a.u., arbitrary units. Fig. 8. Dependence of ceff_2 on the Al screen thickness L3; d1=1000 nm, d2=1200 nm, L1=500 nm, L2=400 nm, L3=50 nm, L4=100 nm, L5=1000 nm, a=500 nm, u=200 nm, b=200 nm, t=50 nm. Fig. 9. Cross-sectional view of the electric field and energy flux in the structure with the MIM waveguide: (a) x component of the electric field; (b) absolute value of the electric field; (c) z component of the Poynting vector. d1=1000 nm, d2=1200 nm, L1=500 nm, L2=400 nm, L3=50 nm, L4=100 nm, L5=1000 nm, a=500 nm, u=200 nm, b=200 nm, t=50 nm; a.u., arbitrary units.